When we started cruising, in the olden days, most cruisers – ourselves included – sold their home to help pay for their new life afloat. This was before GPS, which meant considerable navigation risks, and insurance, if available, was way too expensive for most. Considering that in those days roughly one out of ten yachts crossing the tropical Pacific ended up permanently parked on a reef, you can see where the experience, even when successful, would color your outlook. When we started building, first for ourselves and then a few friends, everyone felt the same: we wanted the highest factors of safety practical, and were prepared to sacrifice in other areas, if required, to achieve this goal. This process eventually brought us to some basic construction approaches. Our goal in the keel area was four times the American Bureau of Shipping rule, rudder structures were designed to twice ABS, our bow areas had significant added laminate for impact, and the turn of the bilge, where a yacht typically lies on a reef – the grinding zone – had considerable extra laminate. Then there were our watertight bulkheads. Over the years we’ve heard several yarns about folks testing these features. There was the Deerfoot 2-62 Moonshadow‘s interaction with the Tuamotus, whereupon she T-boned a reef while running downwind in strong trades. After a week ashore she was pulled off by a French tug, and after some repairs in New Zealand, went on to circumnavigate (the chapter detailing this experience in Practical Seamanship is linked here. You can also read the owner’s original account from 1998 on SetSail here). More recently FPB 64-3 Iron Lady had a dalliance with a Fijian reef (see post on experience here), spent six hours pounding in the surf before she got herself off, with minimal damage. FPB 64-3 also had a run in with “The Rockpile” on the Intracoastal Waterway, where she impacted a rock ledge at 9.7 knots, bending a stabilizer shaft, but containing the ensuing leak within the stabilizer coffer dam. In a close future I will, most probably, need your help. Theta Volantis is now in Guadeloupe. I’m a professional seaman and I have never seen a sailing yacht like she. 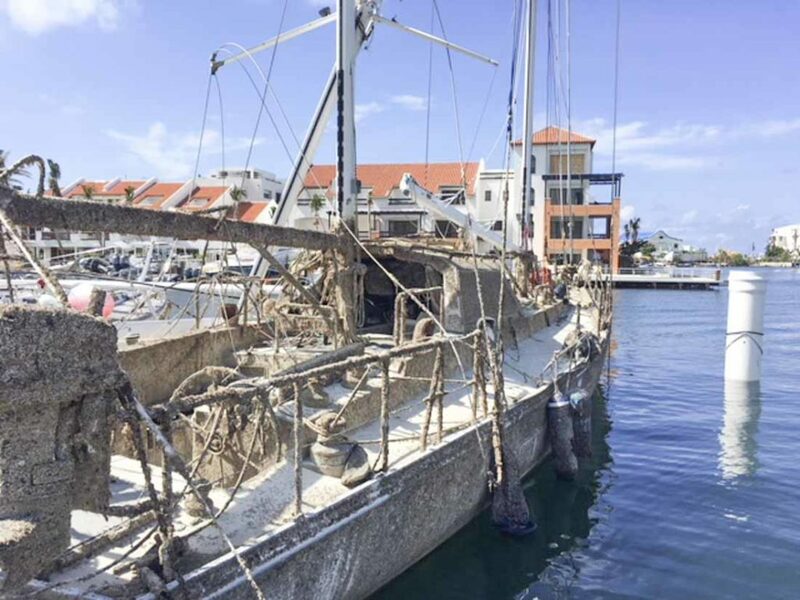 Despite two months under the water, after hard work during two weeks to fix the main problem, I sailed with her from Saint Martin to Guadeloupe with her own sails. This sail boat is so well done that it was a good trip. Now I will have to take care of her. She was in a marina [during the hurricane], a mast from another boat fall down on her and cause the hole. From a witness who was looking at her from an apartment, during the hurricane, she sank in the early morning after Irma’s passage. It took all night wave after wave. My plan is to fix and refit her and work with her. Could you, please, assist me to give a new life to Theta Volantis? That must have been some two weeks of work! Theta Volantis started her career by crossing the North Atlantic during a late equinoctial gale season, and was caught in what may have been the worst weather one of our yachts has ever endured. There is a chapter in Surviving the Storm devoted to this event linked here. Additional information on getting yourself out of trouble will be found in Offshore Cruising Encyclopedia and Practical Seamanship. All four of our books can be downloaded for free here. We mention these instances because we would like to see the marine industry put more effort into making their yachts tougher. 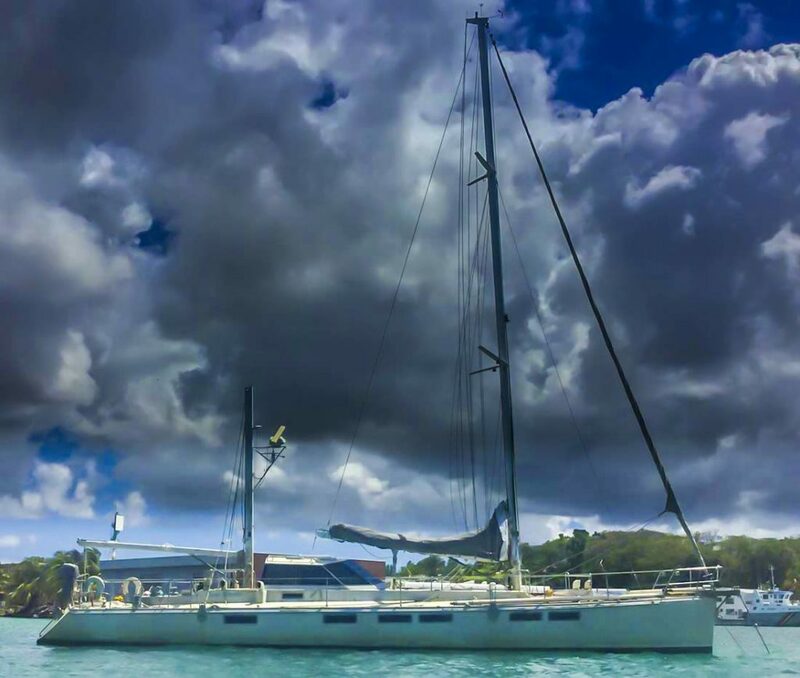 Most buyers do not understand the risks they face in the normal world of long distance cruising with conventionally built yachts. We are hopeful that these few examples might lead to more awareness and pressure on the industry to do better. A final note. 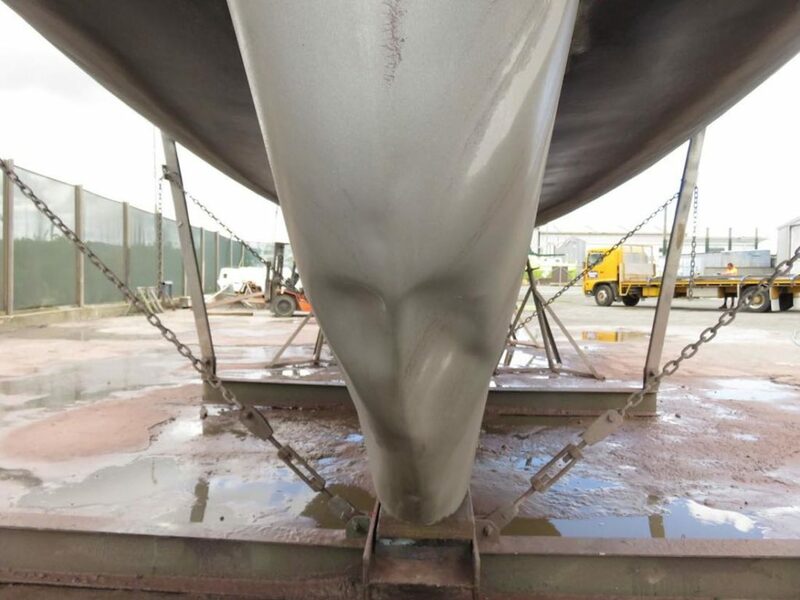 Although we have tried over the years to build toughness into our yachts, this post is not making representations or warranties about what may, or may not occur with one of our yachts should it encounter difficulties. Do not assume the same results would occur were you to attempt something similar. There are simply too many variables involved, including age, condition, prior damage history, wind and wave, to make a realistic projection from the data within this post. This entry was posted on Wednesday, April 11th, 2018 at 11:36 am and is filed under Dashew Logs, Dashew Offshore History, The Logs. Both comments and pings are currently closed. was the last photo in this series taken after Theta Volantis was refloated? I ask as the mizzen is broken and the hull looks discolored. Yes, this is after she was underwater in the harbor for two+ months.